Now a bustling tourist site on North Carolina’s Outer Banks, Roanoke Island was the site of the first English settlement in the New World, established in 1585. For one of the expeditions to the island, English explorers brought along Thomas Hariot, a talented scientist and mathematician tasked with studying and cataloguing the natural resources of the area. Having studied the local Algonquian language before his arrival, Hariot played a pivotal role in establishing positive relations with the resident Carolina Algonquians and recorded extensive accounts of the Native Americans’ customs before returning to England in 1586. 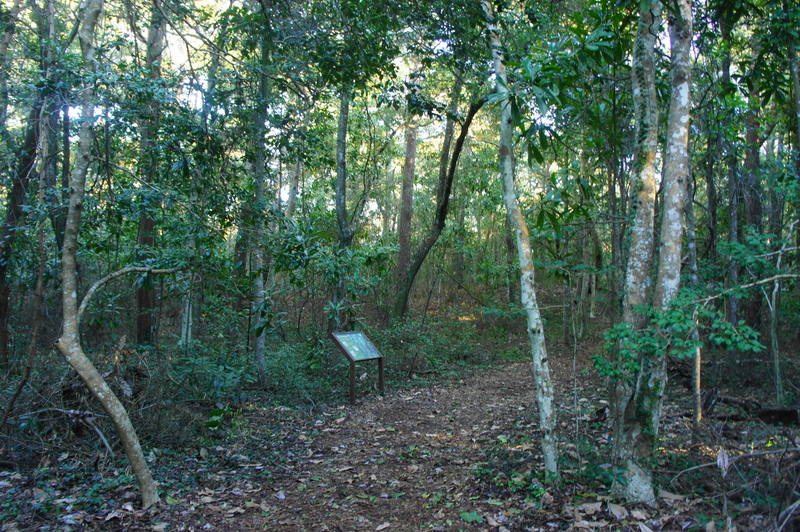 Today, a short nature trail in Fort Raleigh National Historic Site is named in his honor, and the path passes through wooded terrain similar to what Hariot observed during his short visit. Fort Raleigh National Historic Site is located near the northwest tip of Roanoke Island, three miles from Manteo, North Carolina. The park preserves the site of the first English settlement and also serves as a commemoration to later events, including the establishment of a large Freedmen’s Colony for runaway slaves during the Civil War. 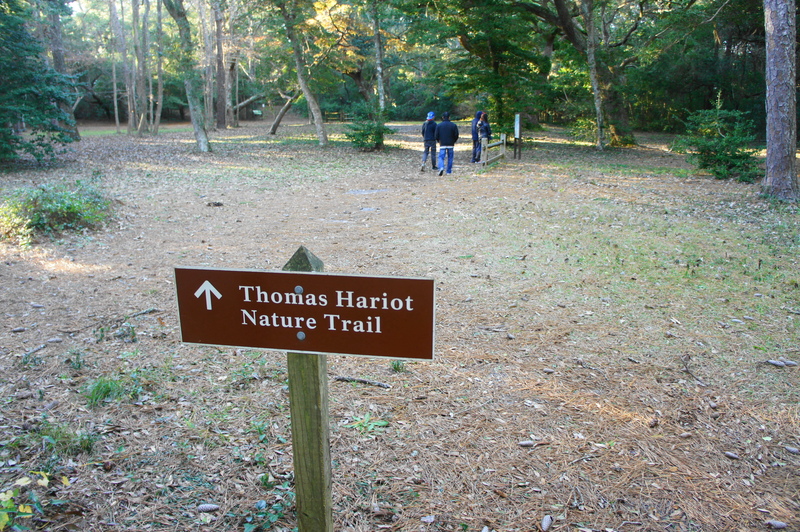 To reach the short Thomas Hariot Trail, park at the Fort Raleigh Visitor Center, located along a circle drive in the heart of the National Historic Site. 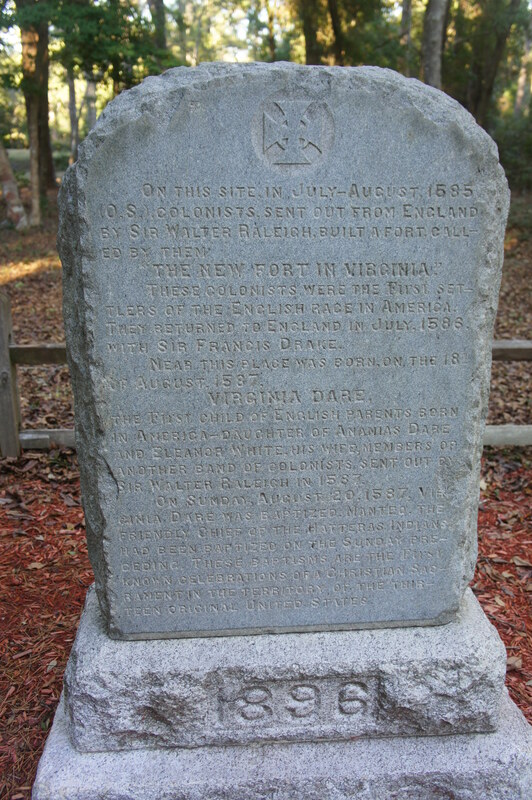 Bearing right, behind the visitor center, follow the paved track as it passes the 1896 monument, dedicated to Virginia Dare, who became the first English child born on American soil in 1587. 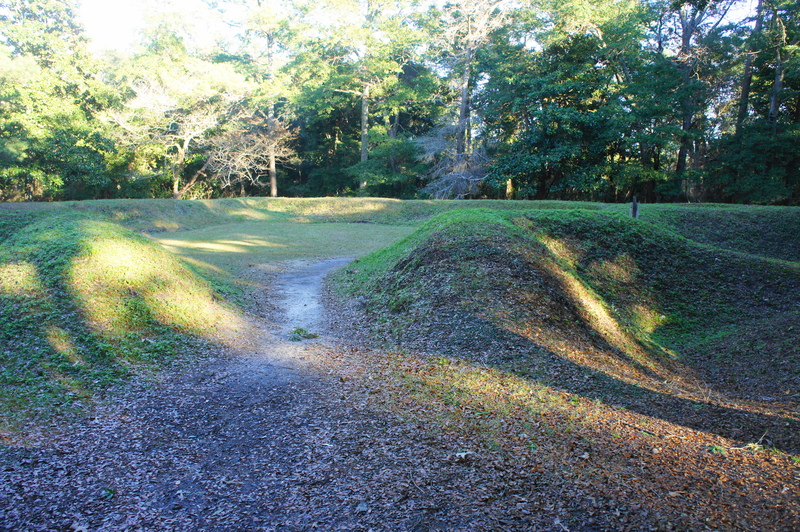 Beyond the monument, continue to the Reconstructed Earthen Fort—a reconstruction of an old structure thought to be part of the English Colony. From here, the dirt Thomas Hariot Trail begins off to the left. 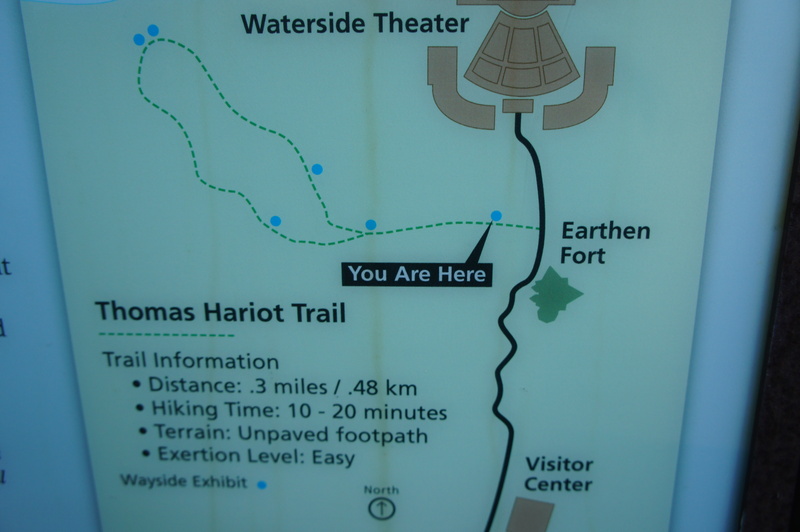 Following the signs for the “Thomas Hariot Nature Trail,” the path passes an interpretive sign and map on the right and then approaches the edge of dense woods. Stay straight at the first fork and take the right-most track as it climbs into the forest. Here a wayside invites hikers to “join the exploration party” by imagining that you are on the expedition with Hariot and his Algonquian guides back in 1585. 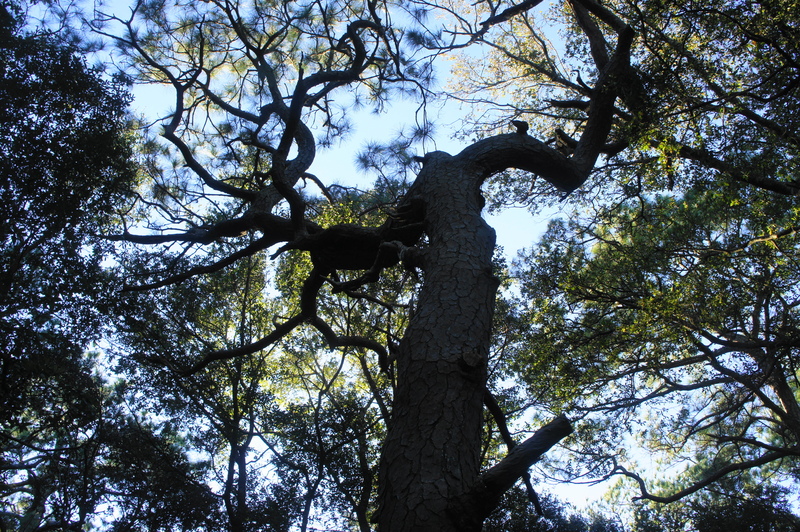 In contrast to the wind- and salt-swept islands further east, the loblolly pines, laurel oaks, and live oaks here on Roanoke Island grow relatively tall. The maritime evergreen forest is quiet and serene, a peaceful contrast to the often-bustling tourist traps on the Outer Banks. 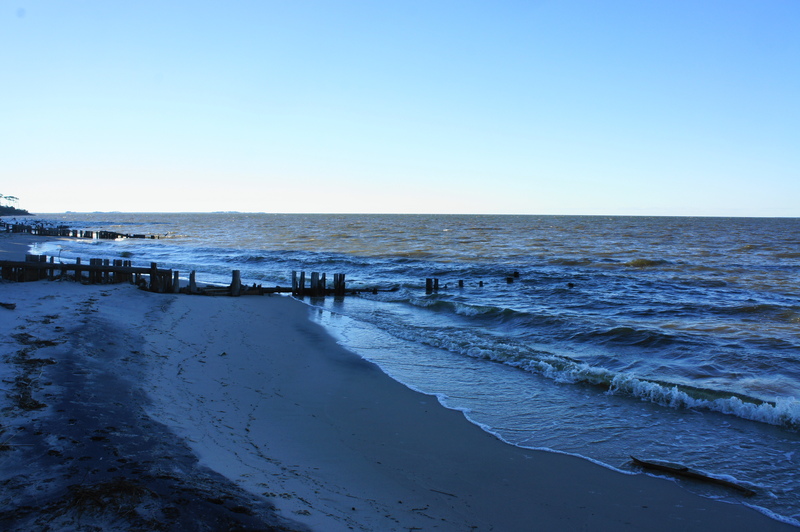 At about 1/10 mile, a short spur trail on the right provides access down to the shores of Albemarle Sound, which feeds into the Atlantic Ocean and dominates northeast North Carolina. Off to the right is Roanoke Sound, a feeder of Albemarle and the primary barrier between Roanoke Island and the outer shores. 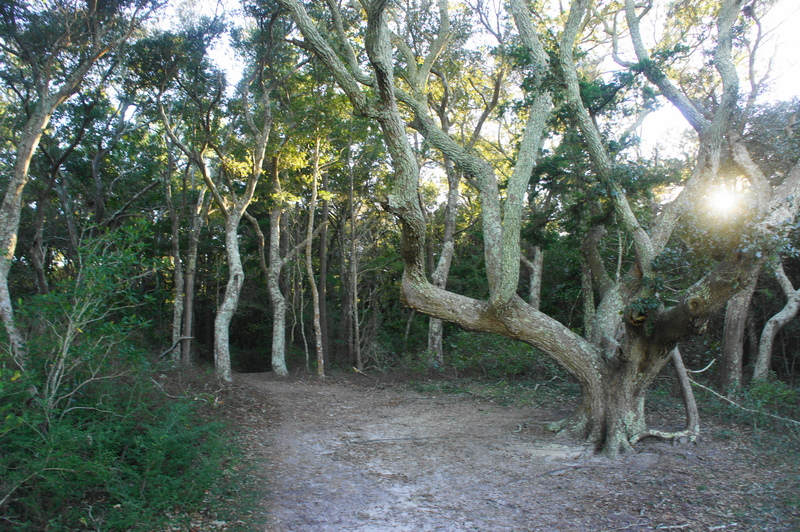 Back up on the main trail, the path snakes around to a shaded viewpoint of the sound that is encircled by a group of wily live oak trees. A small wooden bench offers a chance to sit and take in the lovely scenery and makes for a nice spot to watch the sun rise or set (at least in winter, when the sun stays farther north). The entire hike takes 10-20 minutes, depending on pace. 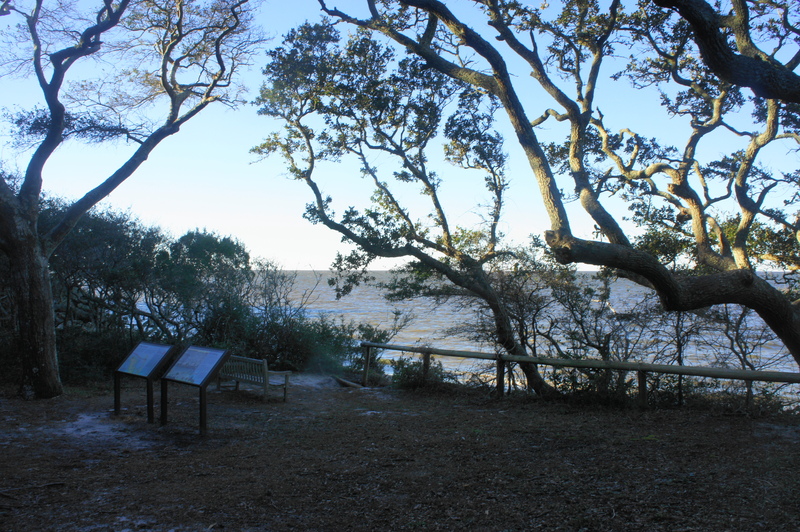 This entry was posted in Easy Hikes, North Carolina, Outer Banks and tagged Albemarle Sound, Fort Raleigh, Fort Raleigh National Historic Site, historic, loop hike, North Carolina, Outer Banks, Reconstructed Earthen Fort, Roanoke Island, Thomas Hariot Trail. Bookmark the permalink.